Adopted into a Seneca Cayuga family in 1993, Marcine had no idea how the exposure to the culture would affect her life. There she found an epic story of compelling visuals she could not resist painting. However with the paintings came a story of an epoch of Peace that few had heard of, a story of three individuals who brought Peace to a world at war. Let Marcine take you on a journey into the distant past through her paintings. An accomplished artist, she brings to life the ancient tales of the peoples who call themselves the Haudenosaunee, People of the Longhouse. We know them better as the Iroquois League of Nations. 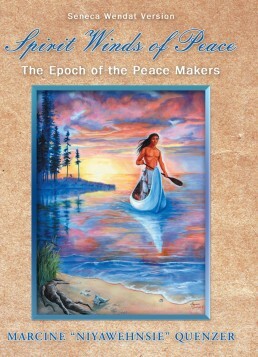 Marcine Quenzer has brought to her book, Spirit Winds of Peace: Th e Epoch of the Peacemakers, the same beauty, eloquence and truth that she brought to the Peacemakers’ journey through her inspirational artwork. Her book does much to reveal this journey – a revelation that is so needed at this time to remind us that love is indeed the answer. Thank you, Marcine, for this gift to all humanity. This story is virtually unknown among all the peoples of the world. Having lived among the Haudenosaunee for 15 years, I discovered a rich and proud heritage that excited the imagination in me as well as the highest values for living. It is a story of Peace, a story of reconciliation, a story of healing. I am an artist, not a writer, nor a historian. The visual impact of these stories possessed me, while the stories taught universal truths. The more I learned, the more I wanted to know- and share. Few know these stories. This story is relatively unknown outside of Native American circles. It is an oral tradition only partially recorded by early ethnographers and anthropologists. Because of the general lack of knowledge concerning this important story, little pieces of a great story have become a narrative of an entire epic adventure that I have brought to life through my art. I fell in love with the rich tapestry of tales that originated somewhere in the distant past in actual history that when woven together, embody teachings that are timeless. With those teachings came the compelling notion of creating a world at peace. The displaced native peoples of the Americas need to be acknowledged, as the remarkable people they have always been. It is time to give recognition of their unique and insightful world view, which will aid in our understanding of each other and lead us to that elusive world peace. Origin stories of the Haudenosaunee (Iroquois) give the basis for their understanding of the world and their relationship to that world. The litany covers the Beginning of Time until the Earth is finished. These stories lay a foundation for our interaction with the Earth, and all her children, and bring forth Earth Wisdom that has been lost by our present day civilization, reminding us of the balance of energies, good and bad, day and night, male and female, and the power of our emotions as a force in Creation. Although Great Mystery provided all things that would ever be needed on the Earth, there came a time when the people forgot their purpose on earth and the instructions that they had been given. This set the scene for a virgin born messenger, a Great Messenger whose purpose was to bring forth a comprehensive understanding of Peace. He meets Hayehwatha, whose emotional and mental healing prepares the way for him to be the Peacemaker’s spokesperson. A third person, a woman, carries the balance of the Law. Known as Jikohnsaseh, the Lynx, she was the last living descendant of Sky Woman, the first person on Earth. She was an honored woman or Yagowaneh among the people. She brought enemies together, and through wisdom and fairness, and her great love for the people, they would leave as brothers. She negotiated treaties. Her word was Law. The Journey tells challenges faced and overcome together, to create unity among all nations through the Great Law. A journey, which when completed, made a significant contribution to the development of democratic ideas through our constitution and all constitutions patterned from it around the world. I first learned of these stories from my husband, Jack "Kennesatah" King, an Oneida Elder. He had been trained as a Ceremonial leader for the Seneca Cayuga of Oklahoma but never held that position. He had been trained along with Richard White, Speaker and Ceremonial Leader for the Seneca Cayuga of Oklahoma.. Assembly of this project was started under the direction of Faithkeeper Richard White in 2002, when it was first presented at the World’s Olympics in Salt Lake City. Richard has since passed away. Since that time, I journeyed to New York and to Six Nations, and had many conversations with Faithkeepers, historians, and clan mothers, who have assisted with the stories.